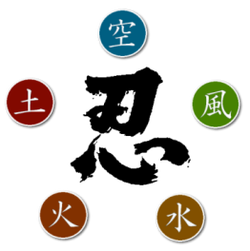 Chi (土 or Tsuchi), Ka (火 or Hi), Fuu (風 or Kaze), Sui (水 or Mizu), and Kuu (空 or Sora) are the Japanese classical elements. You may know these famous elements very well, as they are in order respectively, Earth, Fire, Wind, Water, and Void (can also be translated to Sky or Heaven, but for this discussion’s sakes, we’ll stick with Void). I have noticed that these classical elements are actually quite prominent in Cowboy Bebop, so I’ll start by giving an explanation of the affinity of each element, and then hand the stage to Cowboy Bebop and point out the elements. Chi (土), known as Earth, represents the solid, hard objects in our world. One strong example of this is a stone, which is unmoving and unchanging. Earth is the most stable out of all the elements, and represents stability, certainty, and simplicity. It is also the one element with the most resistance against change. In the mental realm, it represents confidence, and in the emotional realm, it represents a desire to have things remain as they are. Ka (火), known as Fire, represents the energetic, moving objects in our world. Animals are prime examples of this element, full of forceful energy and actively moving. Fire would be the most unpredictable element, giving warmth of life or flames of danger. In our mental state, it is the drive and motivation that spurs us on, and in our emotional state, it is the fiery passion for all that we love or care for. Fuu (風), known as Wind, represents the out-lying, free objects in our world. Air, smoke, and the like, are the prime representations of this free element. Wind is the most liberating of all the elements, allowing us to grow and expand to wherever the winds take us. This element shows up in our mind as a wide open-minded attitude and in our emotions as a carefree feeling. Sui (水), known as Water, represents the flowing, formless objects in our world. Rivers, lakes, and seas are the prime examples, since the rivers always eventually lead to a lake or an ocean. Water is the most flexible element, allowing us to adapt to the change all around us. Mentally, it elusively shows up as our way of adapting, and emotionally, it shows our defensiveness and flexibility. Kuu (空), known as either Void or Heaven, represents objects composing of pure energy. Our spirits, minds, and energies are the representations of the Void. Void is the most complex and important element out of all the classical elements, allowing us to connect to the quintessential energies of the world and our surroundings, a sort of enlightenment if you would. The mind sees this as our creativity and spontaneity as an emotion. And, that’s all of the classical elements. What do all these have to do with Cowboy Bebop, some of you might wonder? Well, take another look at the four main characters and stars of the old favorite plus a surprising character, and you’ll see what I’m getting at. First up is the gravelly, rough Jet Black. By all appearance and personality, his affinity is that of Earth. His clothes show a simple, unchanging fashion style in the time period of Cowboy Bebop, and he has a tough, but gentle personality as seen with his interaction with the bounty hunter gang. In his defining episodes of Cowboy Bebop, it is shown that Jet has had a hard time letting go of his past, and he has remained steadfast in his intentions since then. Jet is by far, the most stable well-rounded character I’ve seen, and the element, Earth, certainly does fit him. Next up is the fiery, hot Faye Valentine. It is quite obvious that her affinity is Fire, and her bold, flamboyant clothes certainly do reflect that. Her seductive and passionate personality matches her own taste of lively pastimes, gambling and thieving. Throughout Cowboy Bebop, she has shown a strong variety of reactions, making her unpredictable and aggressive. But like fire’s nature, she also has a mild temperament and a warm side to her, as seen in her defining moments of Cowboy Bebop. Third up is the free-spirited, carefree Edward Wong Hau Pepelu Tivrusky IV. His shabby, simplistic clothes shows his free nature, unchained by anything and unwilling to conform to others. Like his affinity, Wind, he enjoys expanding his horizons and mind to include all the possibilities and ingenuity of the universe. In his moments, he has been shown as a wanderer and a genius, who is unmatched by the limits of his intelligence and travels wherever the winds may take him (along with the crew, of course). Now we come to the cool, flexible Spike Spiegel. His clothing style feels seamless and smooth, a blue leisure suit with a yellow shirt; very much like the element, Water. His main philosophy is “Be like water and move as naturally as possible.” You’ll notice that his fighting style is also fluid-like, with very little wasted movement. He also has been shown as being, like water, calm as a still lake and quick as a rushing waterfall. Throughout the series, he has shown a remarkable adaptability in dire situations and strong defensiveness for his own personal space and history. As for the last element, Void, after much thought and research, it turns out that there’s actually a surprising character who fits this, and I’m pretty sure that none of you would realize this, considering that he has such a minor role in Cowboy Bebop. Why, it’s none other than our Pembroke Welsh Corgi genius dog, Ein! If you think about it, Ein is an extremely smart dog who’s able to achieve many things by himself, such as answering a telephone, steering a car, or playing Shogi. Clearly, he is able to sense his own surroundings and is able to respond to them as a human. Ein has a distinctive human consciousness, and this is a strong representation of Void.